Understanding thread count is just one factor to consider when selecting sheets for kids! Most people assume a higher thread count means a superior product. However, a lower thread count may be finished in a way to feel like it is a higher thread count. Thread count is just one of the factors used to determine the best sheets for your kids. Thread Count is basically the number of threads woven together in a square inch of fabric including the vertical (warp) threads and the horizontal (weft) threads. 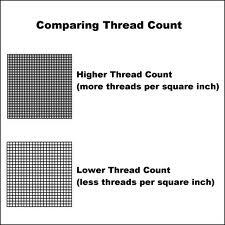 The maximum number of threads that you can weave into a square inch is 500-600. So when manufacturers come up with thread counts of 800 or 1200, they are using creative ways to come up with those numbers. It’s impossible to fit that many threads into a square inch. They may be using multiple ply threads thus counting each thread as more than one. A thread count of 180-200 is considered a good quality sheet. Anything above that would be considered better quality. Sheets with a thread count of 250-300 will feel silkier and when you get to the 300-400 thread count, you will have the premium or luxurious sheets. For comparison purposes, muslin fabric has a thread count of about 150 making it feel a bit rougher. If you hold a lower thread count fabric up to the light, you can see through it easier than a higher thread count. 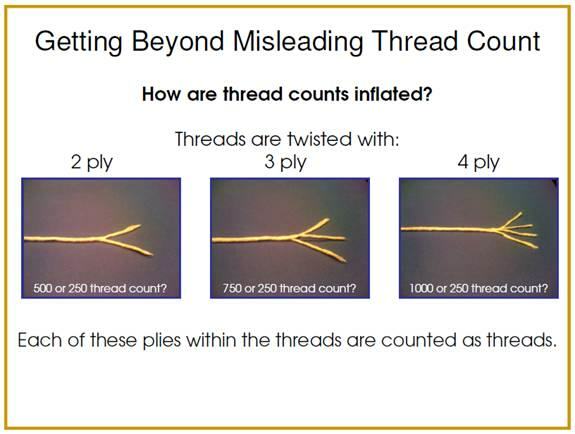 Higher thread counts are less likely to pill or fuzz. How the thread count is determined is called the construction. It may be constructed by counting the number of warp threads and the number of welt threads. 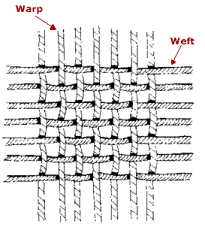 It may be constructed by counting the number of picks in the weft – a pick is just extra threads inserted into the weft. Or it may be constructed by counting multiple ply yarns as more than 1 yarn when it should be counted as one. 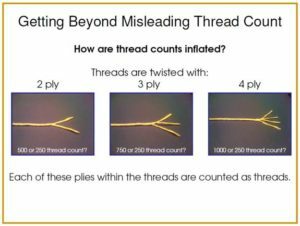 So even though we’ve been led to believe that the higher the thread count, the better the product, that’s not necessarily true. A thread count of 180-200 can be a very good quality product and it can be finished in a way that makes it feel better than the so called higher thread counts. Thread count, or number of threads, is important but the quality of the threads and the weave are also important factors to consider when selecting the best kids sheets. We will explore those in future posts.